WASHINGTON — On a humid night in D.C., people flooded Stanton Road near the Wellington Park neighborhood in Southeast. Holding candles and releasing balloons in remembrance, they gathered at the site where 18-year-old TaQuan Pinkney was gunned down Sunday. “It is just so hard, to wake up every day and know he’s not in the room next to me,” Pinkney’s sister, with tears in her eyes, told the crowd gathered on Thursday. They were there to remember her brother at a vigil. From family, to friends, to teachers, countless people stepped up to speak about Pinkney, and many demanded the community come together to bring an end to the violence that has plagued the neighborhood. “It needs to stop because we are losing the kids who are innocent to the street violence,” Pinkney’s mother Yolanda Pinkney said. Yolanda said TaQuan was walking to a store on Sunday afternoon shortly after 1 p.m. when gunfire erupted in the street. Her son ran from the gunfire but was killed by a stray bullet. Yolanda wants to see justice for her son but also said more needs to be done to make the streets safer. “We need to protect our community; we need to get those bad seeds out,” Yolanda said. Pinkney was a recent Suitland High School graduate, who was set to start classes at the University of D.C. Community College later this year. The teen was also a member of Horton’s Kids, a nonprofit organization that helps kids in the community. Robin Berkley, executive director of Horton’s Kids, said the organization is devastated and called for an end to the violence. “This is not just a loss to this community, this is a loss to this city. This young man accomplished so much, people do not understand, and we are less without him,” Berkley said. 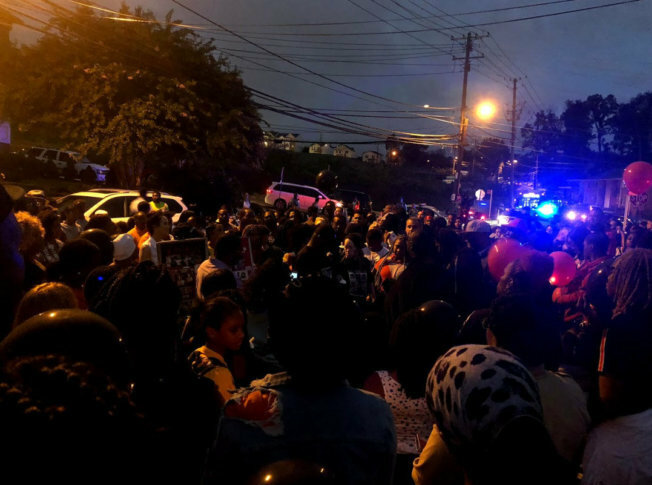 At the conclusion of the vigil, balloons were released, as the crowd called out, “We love you Tay.” D.C. police are investigating the shooting, and said there are still no suspects in the case. The shooting occurred Sunday and police found Pinkney with a gunshot wound. He was then taken to a nearby hospital where he was pronounced dead. Two other victims were located but not injured, and several vehicles were damaged. Below is where the shooting happened.